One post that I try to do each January for y’all is my planner organization post. I made it just in the nick of time by sharing this on the last day of the month, but better late than never in my opinion! 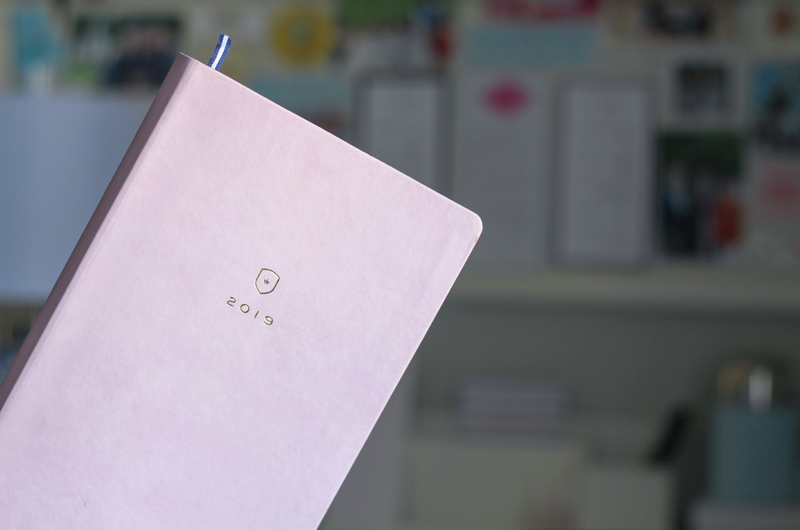 This year’s post may be the least exciting one yet (really selling you on this post, I know) because it’s the first time I’ve shared the contents of my planner with y’all without being a student which means that I don’t have nearly as much written down. For me that’s great, but I think part of the reason in the past why you may have found it interesting to read this post was due to my planner being a colorful well-organized compilation of my life. Now there just isn’t as much to write down since I’m only working instead of balancing that with school and extracurriculars. Hopefully, you’ll still find this interesting and gain some insight organization along the way. It probably comes as no surprise that I am a bit of a planner snob. I have no issue dishing out upwards of $60 for a heavy-duty planner that I know I’ll use daily. For those of you who save money and use a digital planner instead, I commend you but cannot relate to organizing in a way that doesn’t put pen to paper. Even more embarrassing than spending $60 on a planner is the fact that I save my old planners to look back on. Sometimes when I’m feeling overwhelmed or trying to remember something specific, I’ll open up one of my many planners from college and just re-read parts of it. If I could juggle everything I did in college, then chances are I can handle whatever is being thrown my way currently. This year I did something especially bold, I switched from my tried and true Day Designer (which I still absolutely adore and may go back to next year) to Emily Ley’s Dapper Desk Planner. You may be thinking why I felt the need to switch when I love my Day Designers (and the way they all look organized on my bookshelf) so much. Well, the only qualm I had with my Day Designer was that it was bound with a sturdy gold ring. While I never had issues with pages getting stuck or having that get stuck on things it made it a little bit bulky to carry around. The Dapper Desk is leather bound (and naturally I chose the pink leather) and doesn’t have a ring and is slightly smaller with all of my other favorite features, so it seemed like a natural switch. While this planner is equally as thick as the Day Designer, it doesn’t feel quite as hard to maneuver in and out of a tote bag from desk to desk. I use the yearly calendar (starts in January) as opposed to an academic calendar (usually starts in July or August) and did for most of college as well despite still being a student. There is just something about starting the year with a blank calendar that I love. Now that I’m not in school or working on an academic calendar I am glad that I have the yearly version even though it was a bit odd not having an entire school year in one planner back in college. In the same way that I can be a bit of a planner snob, I am also a pen snob. Since I don’t like the way my handwriting looks in pencil (anyone else? ), I stick to solely using pens in my planner. Le Pens and Flair Pens are my go-to with Flair Pens being what I’ve been using lately since I have so many of them leftover from my teaching days. I like the colors of them and that they write smoothly without smudging, but I would say that both brands fit that criterion. Hopefully, none of you planner obsessed people freaked out when I said that I only use pens since I have a system when it comes to tentative plans. Since I now have a job where vacation days aren’t assigned to you, I use post-it notes on the monthly overview of my planner to represent vacation days I plan to take but haven’t yet requested or been approved. Once they are approved, I remove the post-it notes and write down my plans in pen to make the monthly spread look a bit more cohesive. I used to use upwards of six to seven different colors to denote different activities in my planner. 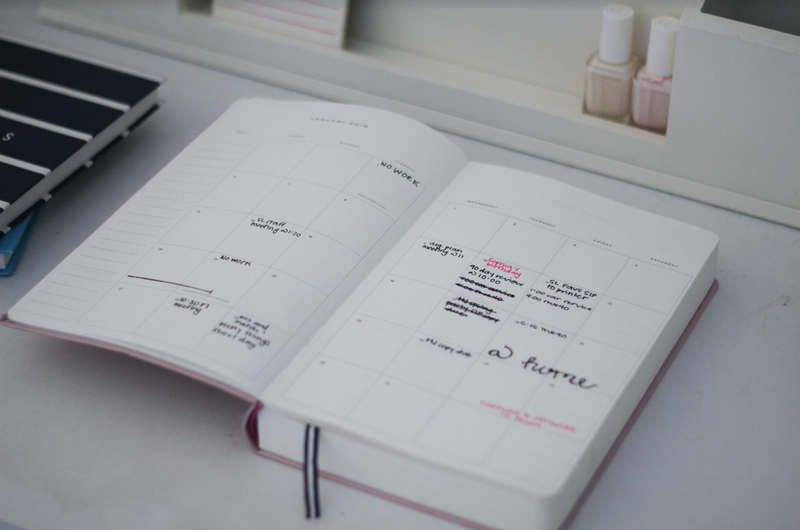 Now that I am not juggling nearly as much I’m down to a mere two colors in my planner, black and pink. If I were to want to add more color, I could write down blog things in here in another color and workouts in yet another one but since I don’t do that, two colors it is. I use black to write down anything related to work and pink to write down various social activities like meals with friends, birthdays, weddings, etc. It makes my monthly overviews a bit less exciting since there aren’t as many colors, but it works well to help me mentally separate work and play. Speaking of the monthly overview, I tend to use this for big picture things. Since I work for a magazine, this is where I write down big photo shoots, binder weeks, when the issue ships, when an issue is on newsstands, and sometimes due dates for copy for the issues. This helps me keep the monthly spread from looking cluttered since there is a page for each day in the planner. In addition to that, I write down fun activities on the monthly overview as well. Whether it’s a Superbowl party, meal plans, weddings, or vacations I’m taking I like including more of these on the monthly overview. I think that I like this because it encourages me to make social plans with friends in advance so that I have something to look forward to. 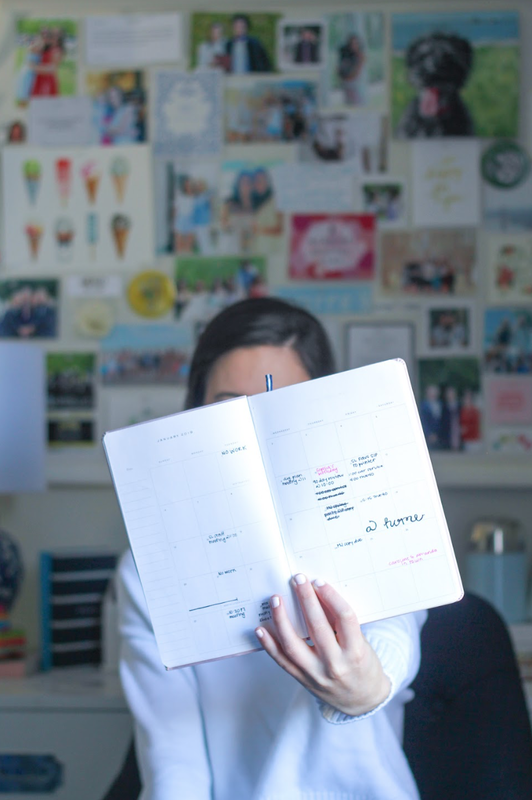 I wouldn’t necessarily write down reoccurring plans on the monthly overview, but as with anything organization wise, it’s best to do what works for you. 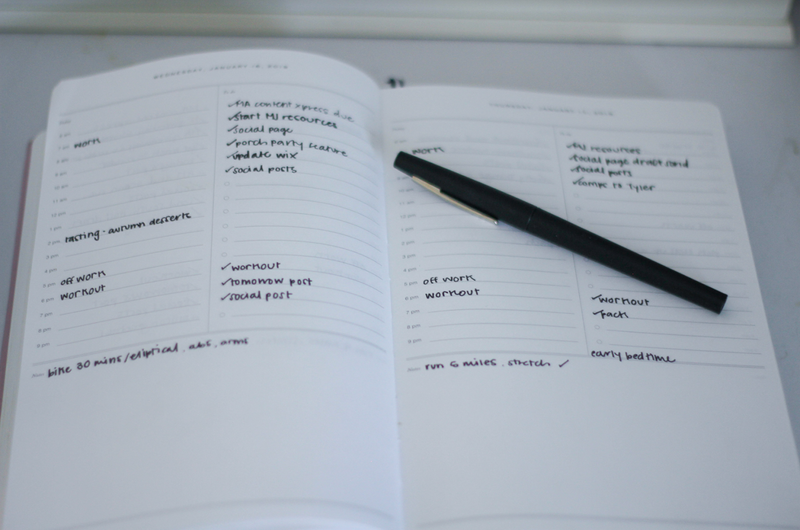 One requirement I have when it comes to choosing a planner is that it has a page for each day. I have very much so become accustomed to using planners that include hourly time slots and to-do lists on a page for me to use. The Day Designer has this as does my Dapper Desk planner from Emily Ley. The hourly part of the daily overview always starts the same with me writing down what time work starts and ends. Any meetings I may have are written down in between which helps me to really visualize what my day may look like. Usually, there isn’t too much written down since I don’t have meetings daily (and I don’t write in what time I take my lunch) but writing them down when I do helps me to make sure that I don’t miss anything. My friends love to make fun of the fact that I write down the simplest activities that you expect to do daily on my to-do list. While I know it may seem silly to write down showering on your to-do list, I do it because it’s something I plan to accomplish during the day. I like to sort of line up my to-do list with the hourly timelines on the page. For example, I put workout further down so that it lines up with 6:00 since that’s when I’m usually arriving at the gym to start my workout. This helps me to separate my work to-do list and personal to-do list while also time blocking in a sense. This is one section that I don’t always use, but I do like having the option of having blank space to write in. 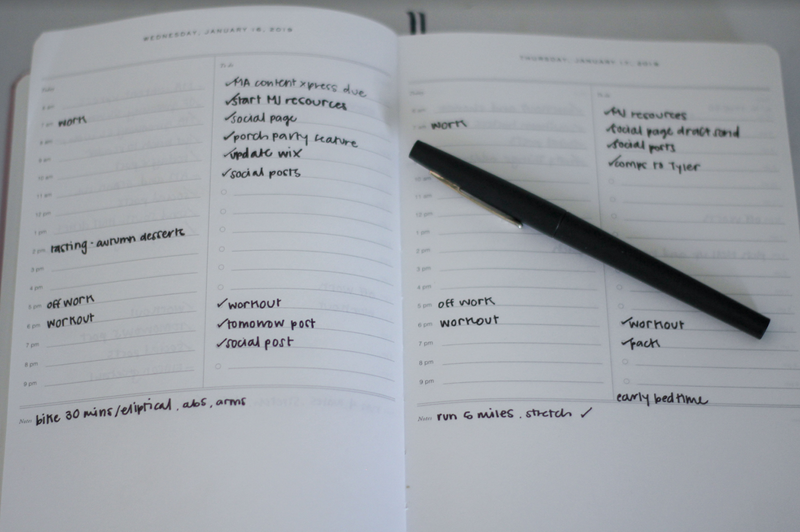 I’ve gotten into the habit of writing down what workout I plan to do each day in this section and will sometimes write down blog post ideas or people/brands I need to email. I’ve also written down grocery lists or the meals I plan to make too so you never really know what you’re going to find from me here. I hope that this helped inspire you to get organized for the rest of the year. If you want to read more about how I’ve organized in the past, you can find those posts below. Love hearing that someone else saves all their old planners as well! I love looking back on them once in awhile. I also only use pen in my planner, but I actually found erasable ones so I don't have to worry about plans changing. I love them! I wanted to get this planner, but they sold out before I did!! I love seeing how others organize, is that weird? 100% agree with the no pencil rule. I would rather have the item crossed out than write in pencil. I feel like pencil never completely erases either. Heading back to university in March, so got the day designer. It's a bit bulky so we will see how I go next year after using it this year.